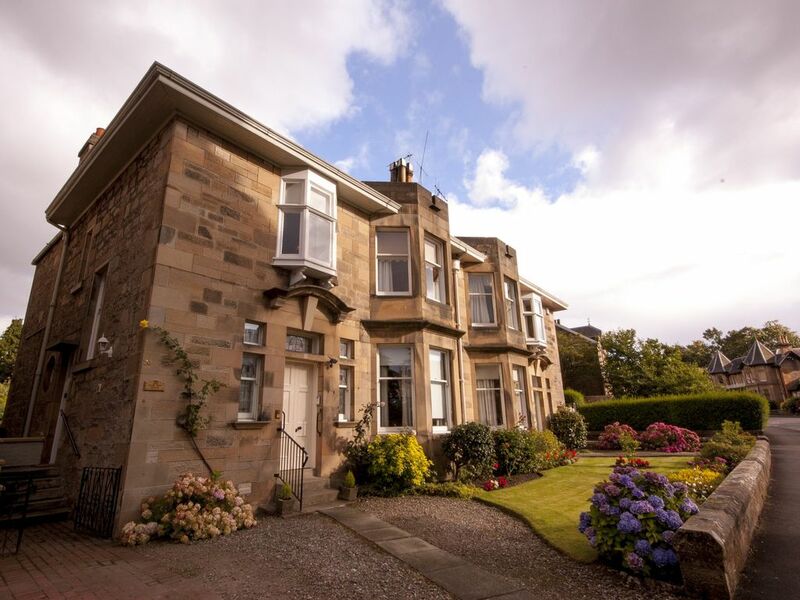 Just 2 minutes’ walk from Stirling city centre yet located on a quiet residential street in the Kings Park area, Pear Tree House offers luxury accommodation for 4 people over the first and second floors of a Victorian sandstone villa. Converted in the 1930s, Pear Tree House has a lovely Arts and Crafts feel. From the private side entrance, an ornate wooden staircase leads you up past stained glass windows into the flat. On the lower floor there is a double bedroom, bay windowed lounge with dining, large bathroom with bath and shower over, breakfasting kitchen and shower room. The kitchen has a gas hob, electric ovens, microwave, dishwasher and washing machine/tumble drier. On the upper level, bedroom 2 has zip and link beds so can either be a twin room or have a super-king size bed. Outside there is off street parking on the drive and an enclosed garden with outdoor furniture so you may relax after a day of sightseeing. Pear Tree house is conveniently located within Stirling, just 10 minutes’ walk from the railway station and within walking distance of shops, bars and restaurants and all Stirling’s historic attractions. Stirling is within easy reach of Glasgow and Edinburgh so you are perfectly situated to take advantage of all Scotland has to offer from this central location. We found the Pear Tree House to be located in the perfect location and very accommodating for the 4 of us. The beds were comfortable and having the family/living room was nice after a long day of sightseeing. It is a terrific place to stay if you want to be close enough to walk to the castle, train station, cafes and restaurants. Check in and out was very easy. We would recommend. Note: grocery store is a good walk if you are carrying bags, wish we would have scheduled grocery delivery however you have to do it a few days prior to your arrival. This is a splendid flat with everything needed for an enjoyable stay. It's well maintained, attractive, warm and comfortable and is cleaned and prepared beautifully. The location is superb, it's a short walk from the town centre and well located for all of Stirling's amenities and wonderful historical buildings and streets. It's in a quiet and lovely residential part of the town. The parking is very useful and there is a private garden, which will be great to enjoy in the warmer months. We booked Pear Tree House at short notice, going not via AirBnB but through Stirling Self-Catering (slightly cheaper!). It proved excellent, and I would recommend it wholeheartedly. There were some VERY minor points ..... for example, the lighting was a bit 'dim' in the living room (I blame the eco-bulbs!) so we brought in a bedside lamp for the small table to cheer things up, the flush on the shower room loo is stiff to use (eg, if you are old or very young), possibly because of the (rather noisy!) macerator (but the shower room is not near a bedroom, so didn't disturb). It would have been lovely if the shower room had been upstairs by the twin bedroom, but it wasn't a major disadvantage at all. The main bathroom is very spacious, and next to the double room. Though we didn't cook much, foodies might want a couple more saucepans maybe?? We couldn't find any drinks mats, which was a shame as we didn't want to mark the beautiful hardwood dining table! Everything else was very well equipped throughout. The sofa suite in the living room is retro-sixties style, very smart, but not the kind you sink into at the end of a long day - but there were lots of cushions to 'soften' them. It's a question of taste really, nothing more than that. The whole décor was incredibly smart and clean, and the entrance hallway is very impressive, as are the two staircases. The flat proved an excellent base for exploring - and it was very warm in winter. We were conscious we were above another flat (the lower floor of the beautiful old stone semi-detached house), but were told the lady there is very elderly, and very deaf, so I hope we didn't disturb her. We didn't walk up to the Castle, but it doesn't look too far from there. The shops and restaurants were very close by - about a five minute walk? The flat was immaculately clean! The keysafe was easy to use, and the whole flat was somewhere we 'made ourselves at home in' very quickly. Highly recommended. Pear Tree House is a lovely old House in the King’s Park area of Stirling. It’s central location makes it ideal for walking in the city, as well, it is a short drive to many other tourist attractions. We could walk to the town to shop, to Stirling Castle, Church of the Holy Rude and to coffee shops and restaurants. Cisco’s coffee shop in the morning was great for breakfast. There was free parking on the property. Checking in and out was simple as we had received detailed instructions by email from Kirsteen. The kitchen had all the amenities we needed. It had ample heating and a washing machine! The living room was cozy, the bedrooms were comfortable and had plenty of closet space. There were two bathrooms in the unit, both on the main floor, which was a bit of a walk in the middle of the night if you were upstairs. Th apartment was clean and well looked after. We would definitely stay here again. Experience good but could have been excellent if attention to detail observed and acted upon. Positives (+) and negatives (-) with this property. +. Great location. Very comfy beds with nice linen. Fresh flowers on landing and some milk in fridge. Well kept rear garden space. Large, spacious rooms that are well decorated. -. Limited utensils in kitchen especially pans. Some areas had not been cleaned thoroughly especially in kitchen. Information pack was very dated, worn / tatty and contained contradictory information / instructions. No anti slip mat for shower floor. Disappointing - better attention to detail with client experience at forefront would resolve the negatives. Would recommend to others if the negatives were addressed.